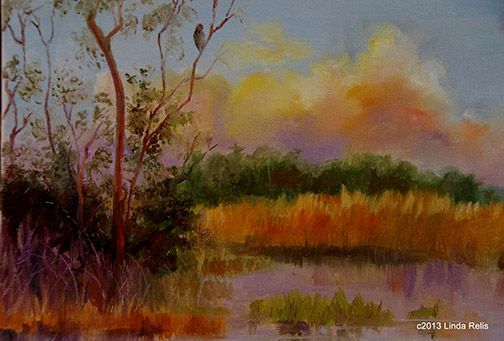 "The Savannas" is done in plein air in the sprawling wetlands in eastern Port St. Lucie, Fllorida. Most of this area is now a State Park. We now accept credit cards and Paypal. You will be invoiced with payment instructions. To purchase a piece of art, contact Linda Relis directly at linda@relisart.com. Include which piece(s) you're interersted in, any questions and the easiest way to contact you. Shipping costs will be added when appropriate. Florida residents, add 6.5% sales tax.